Gangotri Weather : Summer - Cool during the day and cold at night. Be it man's urge to placate the Gods above or to quench his desire for adventure, Gangotri river is an ideal location. Gangotri, the origin of the sacred river Ganges, attracts tourists in large numbers every year. The confrontation with the daunting rivers and attempts to unravel the mysteries of the supernatural world are ubiquitous sights here. Along with the thrill of conquering nature, what one experiences here is the mystical aura that India is so famous for. Couched in the magnificent Garhwal hills, Gangotri (or dakshin Gangotri as it is called sometimes) is at an altitude of 3048 meters above sea level. It is on the northernmost part of the state of Uttaranchal and is very near to the Indo-Tibetan border. It is approximately 300 km from Dehradun, 250 km from Rishikesh and 105 km from Uttarkashi. The summers are relatively cool and winters are freezing cold, with rains in the months of May and June. 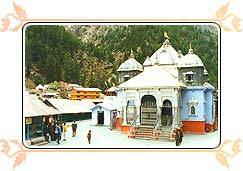 For the devotees and tourists, the gates of the Gangotri dham are open only in the months of May to November. According to an old legend, Lord Shiva rewarded King Bhagirath after his penance and Ganga came down to earth. However, due to her pride, and the fact that the earth would be devastated if Ganga came down in her full force, Lord Shiva caught her in his locks. It was then proclaimed that Goddess Uma or Parvati, Shiva's consort, would bathe in the Ganges daily and only then would she descend on the earth. The sacred stone near the temple denotes the place where Ganga first came down to earth. This is why Ganga is also called by the name of Bhagirathi and the place where it first came down is called Ganga Goumukh. Today a temple has been built there where one can attend Ganga aarti enchanted with sacred Ganga songs. An arduous Gangotri trek along the Gangotri Glacier leads to scenic Nandanvan - the base camp for the Bhagirathi peaks, that offers a panoramic view of the surrounding Shivaling peak. A trek across the snout of the Glacier leads to Tapovan known for its beautiful meadows that encircle the base of the Shivling Peak. Gangotri national park was established in the year 1989. You can spot Gangotri national park is located at the upper catchment area of the Bhagirathi River. Alpine scrub. The new capital of erstwhile Tehri state, offers a magnificent view of the Ganga valley of Rishikesh and the plains of Haridwar. A perfect place for clicking lots of Gangotri photos.